Olivia squeezed lemon juice over her calamari salad. It was a quiet evening at Arnold’s on Kloof Street, which by Cape Town standards meant the average wait for a table was around 15 minutes. ‘How’s the ostrich?’ she enquired, absently licking a finger. ‘I wonder if it will spread all the way to the Hex River Valley. They have some really excellent vineyards there,’ Alan sighed. ‘And now you understand why I’m totally crazy and you shouldn’t be going on collecting trips with me. My dad always said I had a little bit of The Witch in me,’ Olivia said, bringing a glass to her lips. ‘You know. It’s a folktale. The Witch of the Hex River Mountains.’ Olivia squinted at Alan’s apparent ignorance. ‘It’s even got an orchid in it. Surely you must have heard it before. No?’ So the evening progressed with Olivia telling Alan the story as her lips were stained successively darker shades with glass after glass of Pinotage. 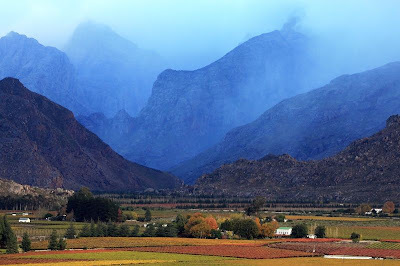 In the whole of the Hex River Valley, there was no-one as beautiful as Eliza, the only daughter of Jacob Meiring. Charmed suitors came to the Meiring farm from far and wide to court her, but none could win her hand. The truth is that Eliza was too proud. Because of her conceit, countless men left the Meiring farm with empty hands and broken hearts. One day, a young man named Filip appeared. He was different from the rest. He sat upright on his horse. His hands knew what hard work felt like. He had a clear laugh, clear as snowmelt. Eliza knew that this was the man she had been waiting for. But she was still proud, and therefore decided to send Filip on a quest. She said, 'Pick the red disa orchid that only grows on the Matroosberg, the highest peak in the Hex River Mountains. Bring it to me so that I may know you are worthy of my love.' Without a moment's hesitation, Filip set off on his mission, riding upright on his horse towards the gravelly mountain paths. He tied his horse to a wild almond and continued on foot. Filip climbed the steep slopes with a smile, higher and higher. When he thought of Eliza, his laughter was clear, like snowmelt. Filip climbed up the dangerous mountains, his hands cut by the jagged rocks. Then he saw the red disa blooming above him on the sheer cliffs. 'At last. Come, my bride awaits,' he whispered, hugging the rock. But as he reached up and snapped the stem of the orchid, the rock beneath his feet crumbled and he fell to his doom. When Eliza heard of Filip's death, she became delirious. Her father locked her in the attic of the farm house, but to no avail. In her grief she found inhuman strength: one night she broke the shutters from the window and escaped, her despair driving her barefoot up the mountain paths. She was never seen again. Everyone who worked the Meiring farm searched and searched, but the only trace that remained of Eliza was a red shawl, snagged in a wild almond at the foot of the Matroosberg. Not long after, the people of the valley started talking, as people do. 'Her beauty bewitched a young man. Her pride cost a young man his life,' they said. 'The witch got what she deserved,' they agreed. 'Her soul will have no rest as she searches for her Filip, even though she will never find him.' Even today, whenever the wind howls around the peaks of the Hex River Mountains, it does so in the anguished wail of a witch. And when the moon glimmers on the first snows of winter, they say that Eliza Meiring walks the mountain paths of the Hex River Valley. I love the way this ties up with the end - two people meeting their death falling off a mountain whilst searching for an orchid!